This is a continuation of my previous post. Please read the previous posts here, Part 1, Part 2, Part 3, Part 4 and Part 5. It looks like airports played a big role in our story. 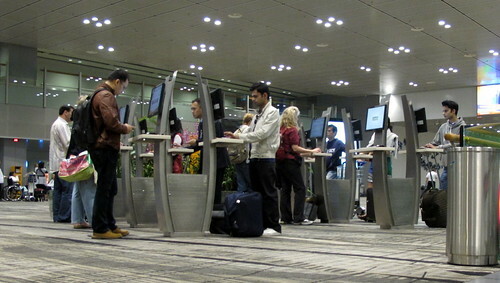 Anyway when I landed in Singapore, it was midnight local time and the place was not very busy. I had a hand carry bag, a laptop bag and my own bag so sleeping was not an option. I just started walking around to searching for an internet connection. I found a kiosk where they had a computer with internet connected. The only bad thing was that there was no chair so I had to stand and use the internet and on top of that it would log out after every 15 minutes, how annoying. Anyway as I had nothing better to, I checked my email, Facebook and decided to write a reply to AS’s last email. u r not online. if u see this mail c if u can come online . I was so bored but didn’t know what else to do. So with my trolley and luggage I made a makeshift chair and just surfed the net. There were not many people online for me to chat with. 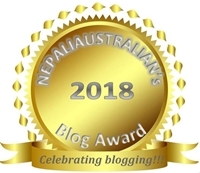 It was an awkward time in Nepal and Australia then. After 15 minutes I was logged out so I logged in again and SUPRISE SUPRISE, AS was online on gmail. Me: How are u? Where r u? AS: I just reached office, saw your mail and came online. Me: (I was a bit disappointed that he would be too busy to chat with me) Ohoo, its ok then, maybe we chat later during your break. AS: I can talk for a while so it’s ok. When I have to go I will let you know. AS: Sure no problem. How was your flight? Me: It was good. Watched a few movies. I am trying to connect the wifi in my laptop it doesn’t seem to be working. Looks like I have to use this computer to chat with you. AS: Ok. At least we can chat. Me: That is great coz I am really bored. There is nothing to do here and I have 8 hours to kill. AS: that is what I wanna do too..
Me: did u have breakfast??? AS: a litttle… nothing i can’t handle..
AS: but chatting with you is icing on the cake..
AS: u have 32 teeth? AS: but am bad at keeping in touch… but am trying to change that.. anyways..
Me: 😀 luving the word trying.. i am sure u r getting better. How was uni? AS: the best part was.. I told you I visualised… before exams right? And it worked. AS: well I pretty much kept that up the rest of the time..
Me: that’s gud. Do u do that 4 ur future too. I mean, what u want, where u gonna live. AS: u did. Don’t think bad of your past… be they happy or sad..
AS: yes… Never a failure… always a lesson..
AS: after meeting you here… I think I started opening up more… now I wonder why I was closed up do much..
AS: and I think all of that was for the best… to get us where we are now.. There is so much I want to write but the post is getting long . I promise there will be lot to come in next posts. Take care till then. P.S. : That day we talked for so long that I have 38 pages of chat. When I was reading through the chat, it still brought a smile on my face. Even though we were not in a relation at that time, it was great to know we were so good friends before we decide to be in a relationship.